Vectorizer and image cleaner: a proven handy tool for designers and CAD/CAM professionals to cleanup, reduce number of colors and vectorize images. The vectorizer is compatible with Jasc PSP (PSP Phat/PSP Slim/PSP Vita), Adobe Illustrator, Corel Draw, Adobe Photo Shop, CAD/CAM systems etc. Especially useful for designs on textile, fabric, vinyl, jacquard, mats and WEB. Helps to create vector graphics for WEB. 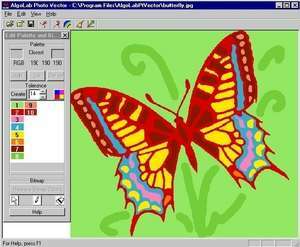 Algolab Photo Vector 1.98.9 is a shareware program and can be used as a demo to try the software until the free trial period has ended. A full version of the program is available after the trial period ends. For security reasons, you should also check out the Algolab Photo Vector download at LO4D.com which includes virus and malware tests. Additional screenshots of this application download may be available, too.